"Let us bring an end to these morally bankrupt endeavors"
"For far too long, the American Government hase done its best to keep reality at bay, while feeding its population a romanticized view of the events on the ground", declared American soldier André Shepherd, who is absent without leave (AWOL) and applying for asylum in Germany, today. "Our aim is to educate, and hopefully bring about an end to these morally bankrupt endeavors." Chris Arendt, Zack Baddorf, Chris Capps-Schubert, Dave Cortelyou, Eddie Falcon, Lee Kamara, Christian Neumann, Shepherd, and Martin Webster, veterans and soldier of the war in Iraq and Afghanistan, will report about their experiences this Saturday in Freiburg (Germany). They are from the United States, Great Britain and Germany. In addition Rose Kazma will report about post traumatic stress disorder (PTSD). She has been practicing for 19 years with individuals suffering from it. 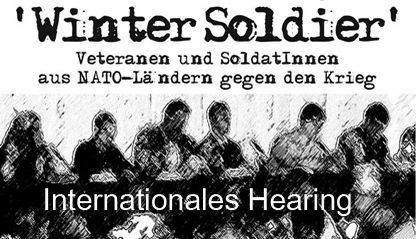 Today Iraq Veterans Against the War Europe invites you to the hearing. The organization published a detailed programme and biographies of all testifiers. The event has been named Winter Soldier to honor a similar gathering 30 years ago of veterans of the Vietnam War. Winter soldiers, according to American founding father Thomas Paine, are the people who stand up for the soul of their country, even in its darkest hours. IVAW held its first Winter Soldier hearings about Iraq and Afghanistan last year in Washington, D.C.
"While much focus now is on the planned withdrawal of Iraq," added former Navy journalist Zack Baddorf, "there are still about 150,000 troops in Iraq today. We’re speaking for them, about the reality on the ground they live day in and day out." Te event is supported by Connection e.V., RüstungsInformationsBüro (RIB), Freiburger Friedensforum, Freiburger Friedenswoche e.V., DFG-VK, Munich American Peace Committee, American Voices Abroad Berlin, Carl-Schurz-Haus Freiburg/Deutsch-Amerikanisches Institut e.V., Tübingen Progressive Americans, Die Linke LV Baden-Württemberg as well as the Freiburg-based groups of attac, VVN/BdA and IPPNW. The hearing will convene on March 14, 2009, 10 a.m. to 7 p.m. in Café Velo, Wentzinger Str. 15 in Freiburg (Stadtbahnbrücke/HBF Freiburg). We will be pleased to welcome you.